News stories from the JTYAF about award winners, fundraising activities, sponsorship, events and general good news about what the JTYAF has been doing. Are you an award winner? Would you like to feature on our website? 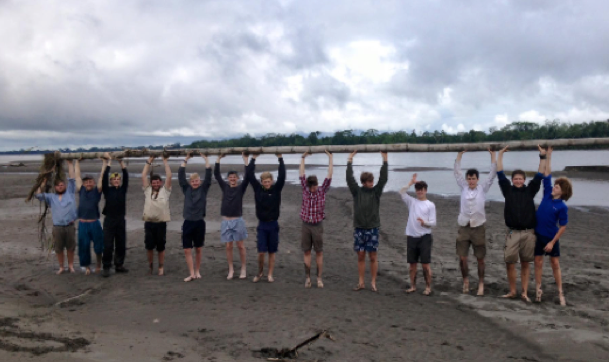 George has recently returned from his Trans Andes expedition and has written to tell us all about his fabulous trip. "Your foundation helped make it possible for me to achieve this and I am truly grateful. I cannot say thank you enough for helping me have the experience of a lifetime and one I will never forget. My expedition was to spend one month in Ecuador completing both physically and mentally demanding challenges. Not only did I complete all these amazing challenges but I got to really see the country and its culture. Meeting the people and venturing their environment was both amazing and shocking. After 24 hours of travelling, we flew into Ecuador’s capital, Quito, at around 10,00ft. The first two days were spent acclimatising and seeing the Quito’s many sites. We stayed just out the main city in a scouts compound. Then the activities started. We had a routine of mountain biking day, climbing day and then a day to rest. We cycled through the valley of volcanoes and around many different peaks including Cotopaxi, which has now started erupting. We cycled around canyons and lakes whilst going through various villages and meeting the local people. It was a real eye opening experience to be able to see the way they live and the different circumstances they have to deal with day in day out. One of the most amazing parts of the trip for me which I will always remember was when a local farming family allowed us to take a look inside their home. The house was no bigger than my bedroom and they shared it with almost 200 guinea pigs, which is a well-known delicacy there. The mountain biking was hard and dangerous at times but it allowed us to see a good deal of the area and some amazing scenery. Then we had the climbing days where I managed successfully to reach the peak of three mountains, unfortunately the weather prevented our group from getting to the summit of the fourth mountain, Illinois. The climbing was extremely difficult for all of us and some unfortunately did not successfully reach the peaks due to altitude sickness. The climbs put us at a height of around 5,800m, with technically climbing to the summits and ten hour days. Although it was hard work, there was not a better feeling than getting to the summit and feeling such an accomplishment. Especially when the whole group got to the top and we could celebrate in good spirit after working as a team. The rest days were mainly spent recovering and seeing more of the town and city. After finishing these 4 mountain bike rides and 4 climbs we headed to the jungle. Although unfortunately we were postponed 8 hours due to a landslide which lead to us all having to carry ourselves and our packs across a plank over a bridge, which was interesting to say the least. After finally arriving we had one night to rest before venturing off on two boats into the Amazon the next day. The Amazon was an experience to say the least! Despite the humidity, the sweating, the dirtiness, the rain, the animals and the insects, it was one of my favourite parts of the expedition. It was a constant mental and physical challenge for the whole group but what we experienced was incredible. We spent time trekking through the rainforest where we got to see the most amazing things, including the animals. I will never forget being metres away from a whole herd of howler monkeys and almost stepping on a tarantula. We also went fishing for piranha and Camen hunting which were both reasonably successful and so much fun. One of the best experiences in the jungle for me was being able to say that I swam in the Amazon River. After being in the jungle, it’s fair to say our group was exhausted. When we came out the next three days were spent in Porto Lopez right on the beach. We stayed in small basic huts but they were right on the sand and the sun was out every day. The beach was amazing and such a nice way to come to the end of our expedition. In the day we were free to do as we wished, which was usually spent playing volley ball and swimming. The food was amazing as they have fresh fish every day. The locals were also all so friendly and kind to our group, we actually met up with another American group for one of our days spent there. Then we headed back to Quito for one final day of buying gifts, before having a huge banquet and then flying home the next day. That was how my expedition went and none of it would have been possible without the funding I received. I thank you so much as it was the experience of a lifetime and one I will never forget. It really made me want to travel more of the world and actually appreciate what I have. I hope to go as a leader on more expeditions with the Dorset expedition society again and further my adventures." What a great adventure, George! The JTYAF supports young people from a wide range of youth organisations providing them with scholarships and bursaries to support their personal development and the pursuit of their ambitions. The John Thornton Young Achievers Foundation (JTYAF) was set up in memory of John Thornton who was tragically killed in Afghanistan in 2008. The JTYAF provides opportunities for young people to help them to develop as individuals and fulfil their ambitions in life as John was able to do. The JTYAF is supported by the following businesses, we are very grateful for their generosity.